If you didn’t already know, our favourite way to travel is by car, whether it’s in our own home state, another part of Australia or in a new country. It gives us the freedom to go where we like, when we like, without having to worry about transport schedules. 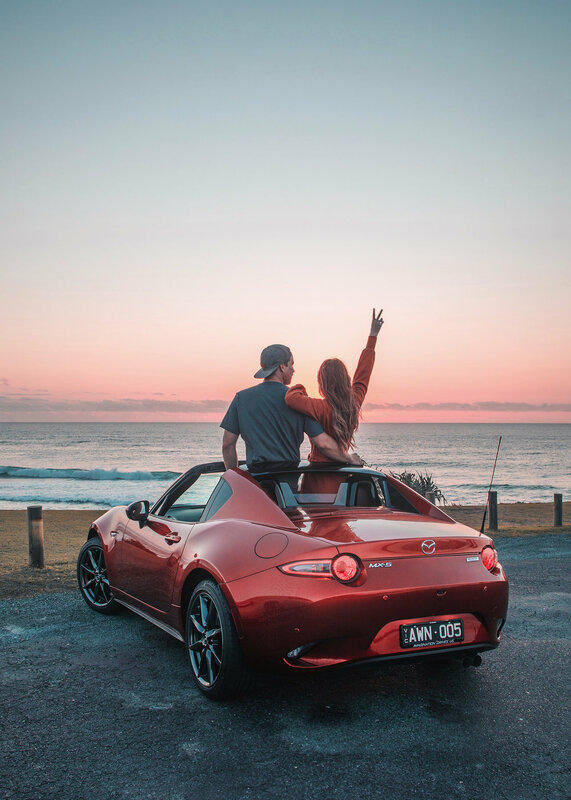 So, when Mazda invited Brad and I on one of their infamous Drive Days to Byron Bay, we excitedly replied with a loud, ‘YES, please!’. After a flight from Perth to Brisbane, a night at the sparkling new W Brisbane (I can highly recommend this hotel – our stay was one of the best we’ve ever experienced!) and a quick trip down to the Gold Coast, we found ourselves being greeted by our shiny Mazda MX-5 and the rest of the Mazda family. With our rooftops down, blue skies overhead and our music blaring, we blissfully cruised down the coast to beautiful Byron Bay. We filmed our whole experience, so make sure you watch the video below (or head to my YouTube channel) to see what we got up to. Trust me when I say, it was a trip to remember! P.S. This is the first video Brad has ever edited, so we’re so excited to see what you think! He’s a man of many talents, that’s for sure.